The Canon EF 100-400mm f/4.5-5.6L IS USM Lens has an excellent focal length range that includes the longest focal length found in a Canon zoom lens - 400mm. This long focal length and focal length range combine with very good image and build quality to make the 100-400 L one of the most popular serious wildlife and sports lenses Canon sells. To say that the Canon EF 100-400mm f/4.5-5.6L IS USM Lens is a member of the Canon L Series quickly says a lot about this lens. Weighing 3 lb (1,380g) and measuring 3.6" x 7.4" (92.0 x 189.0) (DxL retracted), the 100-400 is solidly built and feels like it. The push/pull zoom mechanism is possibly the most noticeable physical feature of this lens. While it works smoothly, it took me some time to get used to it. There is a ring on the back of the manual focus ring that adjusts the tension on the zoom part of the lens. That is a nice feature, but I find myself constantly adjusting the tension to get it just right for the moment. The ring also gets in the way of the manual focus ring - when making a manual focus adjustment, I often inadvertently change the zoom friction ring as well. Set the zoom friction too light and the lens extends by itself when pointed downward - fast and hard if set really loose. Set the friction too tight and zooming becomes difficult. So, it works as it is supposed to. A big benefit to the push/pull design is that your supporting hand remains centered under the lens at all times. Some photographers prefer the push/pull design. One of my favorite lens features found on the 100-400 is image stabilization. The image stabilizer helps significantly when handholding in low light - that is as long as you have a still subject. While the 100-400 L's IS system will detect a tripod and automatically disable itself, turning off IS when using a tripod will save a little battery life and cause the IS mechanism to be locked in a centered position. You can estimate IS on this lens to help with 2 stops or so of shutter speed handholdability. Some may consider the 100-400 L to be a slow (narrow max aperture) lens. 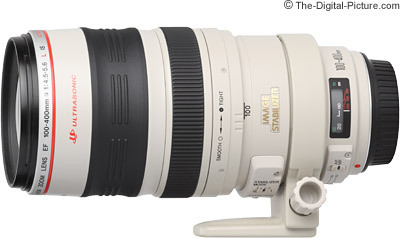 Starting at f/4.5, the 100-400 goes to f/5 around 130mm and finally to f/5.6 at approximately 250mm. A 100mm f4.5 lens is slow, but a 400mm f5.6 is not too bad (relatively speaking). Actually, to buy a faster 400mm lens will cost you a significant additional amount of money. The Canon EF 100-400mm f/4.5-5.6L IS USM Lens is slightly soft in the center wide open at the shorter focal lengths, but gets very sharp when stopped down one stop. When the wide open aperture becomes f/5.6 at 259mm, center of the frame sharpness becomes good and is very sharp wide open at 400mm. Full frame corners are sharp wide open at all focal lengths with the long end suffering a bit from CA. Considering the focal length range of this lens, the sharpness delivered is simply excellent. Note: I have owned multiple copies of this lens and have been very pleased with all of them. I heard from a few people that were not as happy with the lens they personally received - and several have report "lens group misalignment" being the problem. After correction of the lens group alignment, those mentioning this have been very happy. A relatively small amount of CA (Chromatic Aberration) is visible in full frame corners at the wide end of the focal length range. CA is basically absent from 135mm through 200mm. A small amount of CA is present in the corners at 250mm and is noticeable in the corners from 250mm through 400mm is well controlled. Even 1.6x FOVCF body users will likely notice a small amount of CA in the frame corners. The 100-400 L's color and contrast are very good. An 8-blade aperture helps with bokeh (foreground/background blur quality) though this is not a strong feature of this lens. And don't confuse the term "bokeh" which refers to the quality of the blur with the amount of blur. At 400mm, this lens can deliver that often-desired, very strongly blurred background. Distortion ranges from mild barrel at 100mm to minor pincushion from 135-200mm to mild pincushion from 300-400mm. Exposures are in line with my expectations. Flare has not been an issue for me with this lens. The 100-400 L's biggest image quality negative to me personally is the strong vignetting noticeable toward the long end of the zoom range on a full frame body. At 400mm f/5.6, slight vignetting is even noticeable on a 1.6x FOVCF body. This exception aside, vignetting is very well controlled. Equipped with Ring USM, the Canon EF 100-400mm f/4.5-5.6L IS USM Lens focuses very fast, quietly - and possibly most importantly - accurately. FTM (Full Time Manual) focus is enabled. The manual focus ring has a small amount of play in it. The 100-400 obviously extends with focal length increase, but less obvious from the picture below is that this is an internally focusing lens - it does not change lengths or rotate an attached filter during focusing. The above picture shows the Canon EF 70-200mm f/2.8L IS USM Lens (left) compared to the 100-400 L extended and retracted along with their included-in-the-box lens hoods. Both lenses have Wimberley P20 Lens Plates mounted on them. The 100-400 L is shipped with an ET-83C Lens Hood as mentioned above. A nice Canon LZ1324 padded case is also included. Filter size is the common-to-Canon-L-zoom-lens 77mm. The 100-400 L is a partially weather sealed lens. A lens mount gasket is not present, but the switches, focusing ring and zoom ring have moderate dust and moisture resistance. A front filter should be used for sealing purposes. With a minimum focus distance of 5.9' (1.8m), the 100-400 turns in a mediocre .2x maximum magnification. Adding extension tubes to a long focal length lens does not make a great difference in maximum magnification. Especially when the native maximum magnification is achieved at 400mm. In this case, the 12mm and 25mm tubes respectively take the maximum magnification spec to .19x (actually lower) and .35x. Better close-up results are had with a Canon 500D Close-up Lens. Compatibility with the Canon Extender EF 1.4x II and Canon Extender EF 2x II adds to the Canon EF 100-400mm f/4.5-5.6L IS USM Lens' already-high versatility. Canon's DSLR bodies retain autofocus with lenses as narrow as f/5.6 (1-Series bodies will AF with f/8 lenses with the center focus point-only). With the 1.4x attached, the 100-400 exceeds this aperture opening AF requirement - only 1-series bodies retain autofocus. Some use pin-taping tricks to trick the camera into autofocusing, but Canon obviously does not condone this and AF is very slow. Added barrel distortion, CA and a dark viewfinder are additional 1.4x downsides. With the 2x extender attached, the viewfinder is very dark and autofocus is not supported by any Canon bodies. The resulting focal length range of 200-800mm is definitely eye-catching, but ... I seldom use extenders with my 100-400 L.
The Canon EF 100-400mm f/4.5-5.6L IS USM Lens may be the perfect Canon Zoo Lens. It is great for safaris as well. The 100-400 may be the best Canon air show lens available (without going into a multiple-lens setup at least). There is a large number of in-the-field wildlife being captured with the 100-400 L. 400mm is long enough to reach some of the smaller and more distant critters (including birds) - especially on a 1.6x FOVCF camera. The Canon 100-400 L is often the lens I grab when a beautiful sunset is occurring. There is not much time to capture the spectacle of a setting sun - the 100-400mm focal length range can grab a wide variety of framed shots in a short amount of time. The 100-400mm focal length range makes it an excellent landscape lens. Landscape photography generally doesn't require a fast lens. The wide zoom range on the 100-400 allows widely varied captures of a single scene. The Canon EF 100-400mm f/4.5-5.6L IS USM Lens' focal length range would make it the perfect sports lens if it were not for the relatively-slow-for-sports f/4.5-f/5.6 aperture. As it is, the 100-400 works great for sports photography in decent light. You can work a wide range of distances with a single lens. This is a popular watersports lens - IS can help settle a bumpy boat ride. There are many portrait lenses - and the 100-400 works well for this as well. The longer focal lengths provided by this lens make it good for medium-to-very-tight portraits. With this lens, it is easy to capture candid shots of people from longer distances. Long after I created this review, Canon introduced the EF 70-300 L Lens. If you are considering the purchase of the EF 100-400 IS, you should also read the Canon EF 70-300mm f/4-5.6 IS L USM Lens Review to make sure that lens is not a better choice for you. The wide focal length range and long max focal length combined with excellent image quality make the Canon EF 100-400mm f/4.5-5.6L IS USM Lens a highly versatile and a very popular lens. This is one of the lenses I most-frequently recommend to people.